What an awesome week for the Cajun people here in Louisiana! We’re recovering from devastating flooding and want to express our sincere appreciation for the outpouring of love and assistance to all the folks of Acadiana and the surrounds states. Particular thanks to the Cajun Navy who embodied the Cajun spirit and rescued countless folks from flood water peril. It’s also been a wonderful week for Cajun Music! Our new mobile apps are available for Apple devices in iTunes and in the Google Play Store for Android. 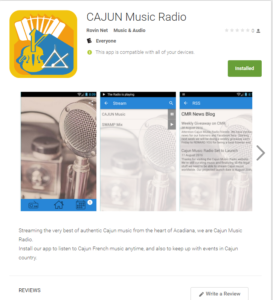 Now you can take Cajun Music Radio with you wherever you go, on your smartphone or tablet! You can also enjoy our music on your computer by visiting our home page. Thanks again to everyone for helping bring the legends of Cajun music to the world.